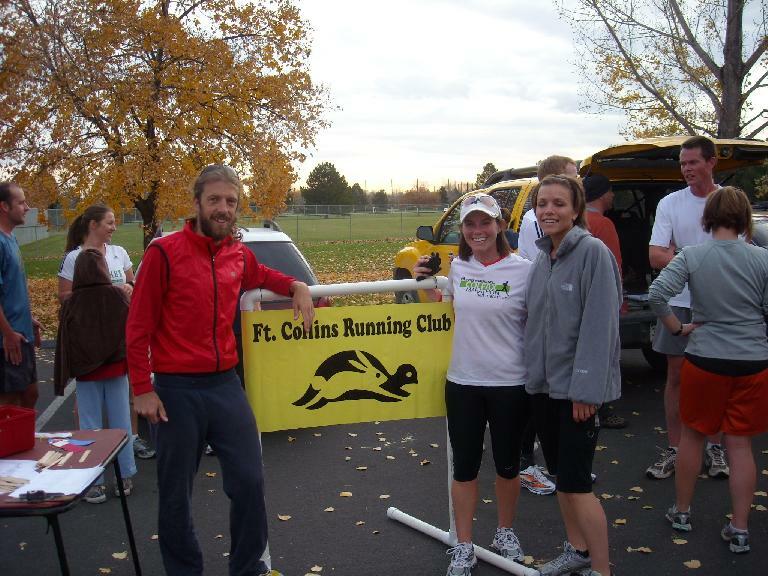 In previous posts about the Tortoise and Hare Race Series put on by the Fort Collins Running Club every year, I mentioned that the start times for runners are dictated by an all-knowing prophet so that everyone would cross the finish line at roughly the same time. It turns out this omniscient being isn’t named Zeus or is the second coming of Jesus Christ, but is a humble black machine called “Nick’s computer.” And while I remain wary about anything that occasionally flashes the Blue Screen of Death, it appears that this number cruncher has a ‘bit’ of logic behind it. Or so it appears after I read a description of the algorithm. It was one whopping page long. The algorithm for predicting the finish time for a T&H race is a two step process. First, for each previous race, using the previous race distance and finish time, a finish time is predicted for the new race distance; the second step is to use all the predicted finish times based on the previous races to calculate a overall predicted finish time. Now the messy details. where the adjustment factor is either 1.06, if the new distance is greater than previous distance, or 1/1 .06, if the new distance is less than the previous distance. The adjustment factor A compensates for the fact that our pace is slower for a longer distance and faster for a shorter distance. For example, if the previous distance was 5K and the new distance was 10K we can’t just double our 5K time and the learned folks who have studied this problem think an average person slows down (or speeds up) by 6 percent. There are a couple other proposed adjustment factors out in Internet land; Nick and I decided to use the simplest one. 1) There are no races from last season; then use the predicted time based on the one previous race from this season. What this does is weight the one piece of current information from this season more heavily than the old information from last season. There are two or more previous races from this season; then the overall predicted time is the average of the predictions based on this season’s previous races; that is, ignore the information from last season. Now that the T&H algorithm is no longer as secret as Google’s for search, we can find all sorts of ways to manipulate it, ha! Although I won’t openly speculate on this web page how because I’d rather not let Leah get an upper hand in the next Tortoise & Hare Series.